This earnings season has far exceeded analysts' expectations, and one sector in particular is outperforming the markets: technology. That's why we've picked out the four best tech stocks to buy now as we wrap up Q2 earnings season. Each of these stocks has been outperforming the markets and is poised for even more returns. Analysts polled by FactSet report they expect quarterly earnings across the S&P 500 to decrease 3.8% this quarter. That's up from their initial estimate of a 4.7% drop at the beginning of the quarter. The reason for the revision is upside earnings surprises from tech and industrial companies. Overall, earnings in the tech sector are expected to fall 2% this quarter. 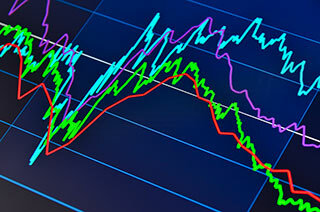 While that may not appear bullish at first, analysts had previously projected a drop of 7.3%. After materials companies, the tech sector has posted the largest upward earnings revisions of all sectors this quarter. That's according to research by Morgan Stanley. Tech has also been among the top in besting estimates for both sales and earnings per share, Credit Suisse said. A handful of marquee tech companies have trounced Wall Street expectations and seen their stock prices hit all-time highs. Money Morning Director of Tech & Venture Capital Michael A. Robinson said recent earnings show just how vital the mobile and cloud-computing sectors have become. He especially likes four leaders in the two sectors. You see, more than 1 billion smartphones are deployed around the world. And thousands of businesses and millions of consumers now use the cloud every day. "These four earnings leaders all harnessed the power of one or both of these vital technologies," Robinson says. Tech Stocks to Buy No. 1: Facebook Inc. (Nasdaq: FB) crushed Wall Street's expectations on July 27 with earnings per share (EPS) of $0.97, versus an estimated $0.81. Net income for the quarter soared 186% to more than $2 billion on a 59% sales increase. That means income is rising three times faster than sales. Daily active user count was 1.13 billion, better than expected and up 17% year over year (YOY). Monthly active user count was 1.71 billion, better than expected and a 15% YOY increase. Mobile daily active user count was 1.03 billion, an increase of 22% YOY. FB stock hit an all-time high of $128.33 after results. In March 2014, Robinson wrote excitedly about FB's WhatsApp acquisition. "If you listened then, you've made 79.5% on your money," Robinson wrote Aug. 3. "By contrast, the S&P 500 is up a mere 15.9% over the same period." Tech Stocks to Buy No. 2: Alphabet Inc. (Nasdaq: GOOGL) posted EPS of $8.42 on July 28, versus an expected $8.04. Revenue rose 21.3% YOY to $21.5 billion, also better than expectations of $20.77 billion. Google continues to dominate search, YouTube continues to garner video ad budgets, and core Google segment margins continue to expand at a steady pace. Ad spending on mobile jumped 63%, compared with search-based ad growth of just 10%. "Google is no doubt benefitting from the fact that there are now more than 1 billion smartphones in use around the world, making mobile search and commerce a growth area for years to come," Robinson explained. Shares rose to an all-time high of $810.35 in the days after the report. GOOGL shares are up 19.40% over the last year. Tech Stocks to Buy No. 3: Amazon.com Inc. (Nasdaq: AMZN) shares hit an all-time high of $766 on July 29 after the company posted another strong quarterly earnings report. Shares went on to hit $770.50 in the week following the report. The online retail giant posted adjusted EPS of $1.78, smashing estimates for $1.11. Sales rose to $30.4 billion from $23.19 billion a year ago. Analysts were looking for $28 billion to $30.5 billion. Sales from Amazon Web Services (AWS), its industry-leading cloud business, were $2.89 billion. That was up sharply from $1.82 billion a year earlier. The Street was expecting $2.83 billion. The unit is on track to exceed CEO Jeff Bezos' goal of $10 billion in sales this year. At a recent $767.66, shares are up 13.59% year to date. Tech Stocks to Buy No. 4: Microsoft Corp. (Nasdaq: MSFT) made a bold move in June when it announced it would buy professional networking site LinkedIn Corp. (NYSE: LNKD) for $26.2 billion. The deal is all about the coming together of the professional cloud and the professional network. Business leaders look forward to benefits from the tie-up. Tech companies and their customers are looking for ways to get even more out of social media. Robinson notes Microsoft's comeback started around the time Satya Nadella took over as chief executive officer – and made the cloud and mobile his prime targets. "I first told you about Nadella and his plan back in May 2015," Robinson said. "Since then, Microsoft is up 35.6%, while the S&P 500 has puttered along at a 9.8% growth rate." On July 19, MSFT posted fiscal Q4 EPS of $0.69 per share, $0.11 better than expected. Revenue rose 2.1% YOY to $22.64 billion, also better than the $22.14 billion expected. At $58, MSFT shares are up 21.94% over the last year.